CHARLOTTE HARBOR â€” The pastor of a Charlotte Harbor church had 16 church members booted from a service after they allegedly refused to stop singing and let the clergyman preach. Deputies were called at 10 a.m. Saturday by Pastor David Noel of the Seventh Day Adventist Church on Harborview Road. Noel told a deputy he was instructed by regional church superiors to involve law enforcement to remove the rogue choir. The deputy issued trespass warnings to the group, and all 16 left the church without incident. Guess what it was all about? Did the clergyman move a couple of chairs and a font? Nope. Was it because Pastor Noel was refusing to include the epiclesis in the eucharistic prayer? Nope. No, it was that old church favourite (or ‘favorite’ as they would probably prefer): money! Something, admittedly, that Jesus speaks about most in the Gospels. Deputies say the dispute is rooted in concerns about the handling of church funds. The members of the rogue choir told deputies they’d handle those concerns within the church. I certainly admire the protester’s method for disrupting a service. None of this storming the pulpit, or chaining yourself to the votive-candle stand. Sing! Posted on Wednesday 9 November 2005 Monday 25 June 2018 Categories God ProjectTags God ProjectLeave a comment on Good or bad news? Thought this might amuse you! 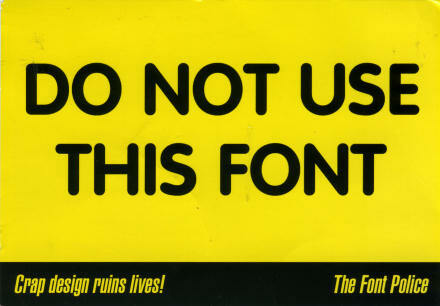 I’m quite picky about my fonts, and about design in general. 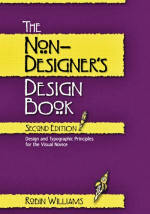 One of the best (and most accessible) books I’ve ever read on design for DTP publications is The Non-Designer’s Design Book (Second Edition): Design and Typographic Principles for the Visual Novice by Robin Williams (No, not that one!). It’s a great book: I thoroughly recommend it. And for all you font anoraks out there, the font used on the postcard looks like “Elementary Bold”. On Thursday I have a rehearsal for a monthly youth event called Powerpoint, which is now being overseen by SU Scotland. The next Powerpoint is on Friday evening from 19:30. 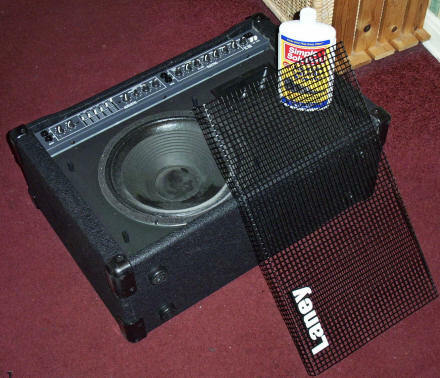 Imagine my dismay the other evening when I got my guitars and amps out to check them over to discover that one (or more) of our cats have pee-ed on my Laney GC80A amp. This afternoon I carefully removed the front kick-grille and washed it and the cabinet down with Simple Solution’s Cat Spray & Urine Stain & Odor Remover. What a marvellous liquid! For years I’ve been looking (obviously not hard enough) for something that effectively deals with cat stains, and now I’ve found it. I’ve already used it on a carpet, my wardrobe doors(! ), and now my guitar amp. uric acid crystals and salts, which is the er… salty, crystally part. Seemingly a lot of products will work on the first two parts but not the third, and the crystals and salts just dry and become dormant. But as soon as the area gets wet again the smell returns. Simple Solution’s Cat Spray and Urine Stain and Odor Remover is biological and works on all three parts. And do you know what? It really does work. It’s great. Now I can be certain that the only thing that will stink on Friday night is my playing! 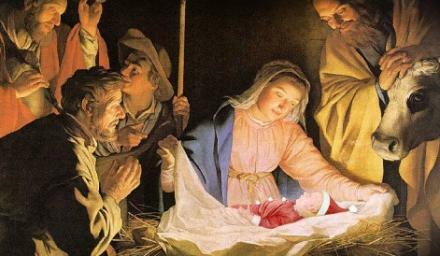 Image taken from the “Go on, ask him for something this Christmas.” Churches Advertising Network campaign, 2003. Each month I write a column in the Scottish Episcopal Church‘s magazine Inspires. This month I’ve been asked to theme it around Christmas Carols. Only, I was asked this yesterday. The deadline is tomorrow. Posted on Wednesday 9 November 2005 Monday 25 June 2018 Categories MusicTags God Project, Music5 Comments on What is your favourite Christmas Carol?